Technically speaking, aeration is the naturally occurring process of air exchange between the soil and its surrounding atmosphere. Practically speaking, aeration is the process of mechanically removing small plugs of thatch and soil from the lawn to improve soil aeration. Textbooks often refer to the practices of soil aeration as soil cultivation (coring, spiking and slicing.) The aeration process is also commonly called core aeration in the lawn service industry, and homeowners often refer to it as aeration. Core aeration helps the health and vigor of the lawn and it’s root system. The following are other benefits of core aeration. The type of aeration used influences the benefits obtained from aeration. Our equipment has hollow tines which removes soil cores of 3/4″ diameter and up to 3″ in depth of penetration. Penetration depth depends on the soil type, soil moisture, tine diameter, and the weight and power of the aerator. For example, tines penetrate sandy soils easier than they penetrate heavy clay soils, and penetration is better in moist soils than dry soils. In general, turf responds best when core holes are close and deep. The closer tine placement removes more soil, exposes more soil surface area for water and fertilizer uptake, and it alleviates compaction quicker than wider tine spacing. may have been removed or buried during excavation of the basement or footings, leaving subsoil that is more compact, higher in clay content and less desirable for healthy lawn growth. These lawns need aeration to improve the depth and extent of turfgrass rooting and to improve fertilizer and water use. Intensively used lawns are exposed to stress from traffic injury. Walking, playing and mowing are forms of traffic that compact soil and stress lawns. Raindrops and irrigation increase soil density by compacting soil particles and reducing large air spaces where roots may readily grow. Compaction is greater on heavy clay soils than on sandy soils, and it is greatest in the upper 1 to 1 1/2 inches of soil. Aeration helps heavily used lawns and lawns growing on compacted soils by improving the depth and extent of turfgrass rooting, allowing better water uptake, enhancing fertilizer use and speeding up thatch breakdown. Most home lawns are subject to thatch accumulation. If thatch is left unmanaged, it can lead to serious maintenance and pest problems. For example, thatch accumulation of more than 1/2 inch on Kentucky bluegrass lawns impedes water, fertilizer and pesticide effectiveness. Core aeration reduces thatch accumulation, minimizes its buildup and modifies its makeup by incorporating soil into the thatch, As soil is combined with the thatch debris, soil organisms are better able to break down the thatch and reduce its accumulation. Annual aeration is beneficial for most lawns. Lawns growing on heavy clay or subsoils, and lawns exposed to intense use benefit from more than one aeration each year. Most turfgrasses respond favorably to aeration when it is properly timed. Both spring and fall are ideal times to aerate cool season turfgrass such as Kentucky bluegrass and perennial ryegrass. In most cases, spring aeration is performed between March and May. Fall aeration is done in late summer and early fall, usually between August and November. Aeration before or at the time of late season fertilization enhances root growth responses and improves spring greenup and growth. Although aeration is beneficial for lawns, it also can open up spaces for weeds such as crabgrass and annual bluegrass to invade the lawn. It is best to aerate before you apply pre-emergence herbicides, rather than after. Aerating after a herbicide application can reduce the chemical barrier formed by the herbicide, thereby allowing some weeds to germinate and grow in the lawn. Applying fertilizer after aeration helps the lawn compete against weeds. Water the lawn after aeration, particularly in areas where drought and high temperatures are common. 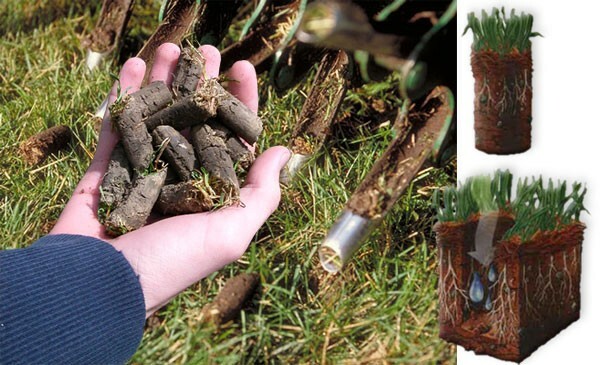 Immediately after aeration, your lawn will be dotted with small plugs pulled from the soil. Within a week or two, these plugs of thatch and soil break apart and disappear into the lawn. About 7 to 10 days after aeration, the aerification holes will be filled with white, actively growing roots.These roots are a sign that the turfgrass is responding to the additional oxygen, moisture and nutrients in the soil from the aeration process. Don’t expect miracles from a single aeration, particularly on lawns growing on extremely poor soils. Most lawns benefit from annual aeration. Lawns that receive this care will be healthier, more vigorous, easier to maintain and have fewer pest problems than lawns that are neglected.